Terry Gallagher Plumbing Inc. has installed a host of underground fire line systems for large municipalities, private businesses, medical offices, shopping complexes, industrial parks, entertainment facilities, recreational areas, churches, schools and residential communities. Industry standards and local or regime building codes require us to have a qualified staff dedicated to these types of fire suppression systems and installations. As a result we have become a bellwether in underground fireline construction and a first line of defense for the most inductively authorizing projects. We service any type of installation whether it be on a State, County or Village road. 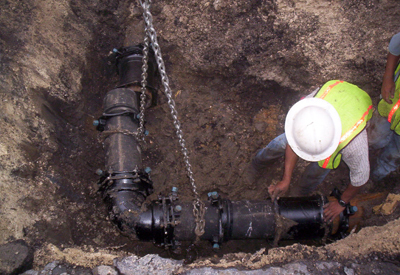 We do wet cuts and three valve clusters, as well as install fire hydrants and perform hydrostatic tests. Call us today at (631) 789-9540 for more information or for a Free Estimate! A water main break can cause extensive damage to your property’s structure and foundation if left untreated. Terry Gallagher Inc. has been installing and servicing septic systems and cesspools for over 40 years. We are fully equipped for any sewer or drain problem. Whether it’s an interior or exterior issue, we have a solution.